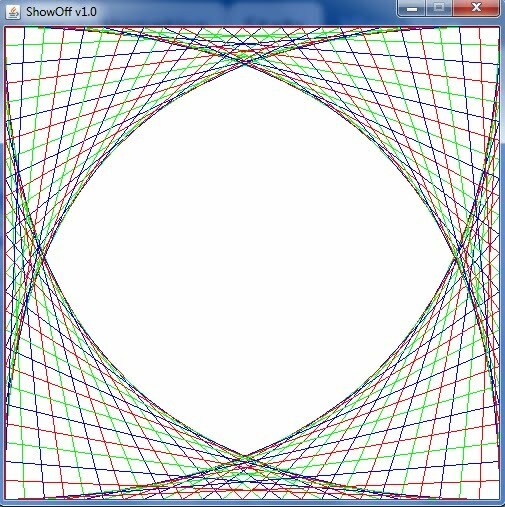 Today I am going to post a program in Java that will create an art using Java 2DGraphics and geometry. 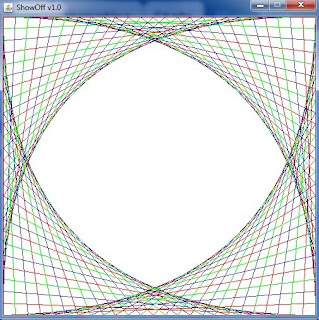 This code creates a curve like a parabola as shown in the screenshot below. Here a set of lines are drawn with different points. The lines are drawn by joining of two points. These points are calculated very precisely over here so that whole thing gives a parabola like curve.It is very simple to create this design. Here is the code for you. Note : This program won't compile unless you create a Java source file named ApplicationFrame that works as a Frame object by inheriting it. So please make the necessary changes. The actual Graphics code which has given the output as shown is written in the paint(Graphics) method. Is this a parabola or catenary?